What a battle! 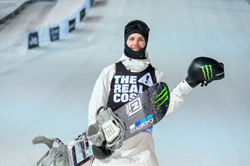 Monster Energy congratulates team rider Sven Thorgren for claiming a strong bronze medal finish in The Real Cost Men’s Snowboard Big Air at X Games Aspen 2019. In a highly contested final session full of never-seen-before tricks and ultra-progressive aerials, the 24-year-old from Stockholm, Sweden held his own against the world’s best riders. The high-energy crowd on Buttermilk Mountain was in for a next-level experience in Friday’s final event. Tonight’s eight final riders took on the 82-foot gap jump in a 25-minute jam session, looking for the best two scores from different takeoff directions. Riders hailed from Belgium, Canada, Finland, Japan, Sweden, and the United States. Thorgren came into the final eight as the highest-placing qualifier. He was hungry for a podium after a collarbone injury and surgery had sidelined him from entering X Games Aspen 2018 and the 2018 Winter Olympics. Fully recovered, the technical wunderkind arrived in Aspen with a few new tricks up his sleeve. A big bag of tricks was exactly what tonight’s competition required. The level of trick difficulty escalated quickly as Canada’s Mark McMorris and Japanese rookie Takeru Otsuka – tonight’s gold medalist – unloaded next-generation moves like triple 1440 switch grab over the chasm. Rising to the occasion, Thorgren battled hard and took the occasional slam while sending some bangers over the massive gap jump: A clean frontside 1440 and triple backside rodeo earned the 24-year-old 76.00 points for a well-deserved bronze, his third career X Games medal. He also pulled an ultra-technical backside 1620 stalefish out of the hat, but did not land clean enough to get a full score. With that said, let’s wait and see what Thorgren has in store for Slopestyle on day three of X Games Aspen. A major shout goes to 19-year-old Monster Energy rider Rene Rinnekangas from Finland, who shredded his way into the finals and put on a strong show tonight. Backside and frontside triple 1440 melons, plus a quad back 1620 melon never landed in competition before earned Rinnekangas a solid fifth place – and a spot on the list of ‘riders to watch’ in Saturday’s Slopestyle and Knucklehuck events. will also be accessible via the ESPN app and WatchABC to viewers who receive their video subscription from an affiliated provider. In addition, all 15.5 hours of live content, plus exclusive competitions, musical performances and X Games Extra shows will be streamed on the @XGames YouTube, Facebook and Twitter pages. Visit http://www.monsterenergy.com for exclusive updates from X Games Aspen 2019 including photos, videos, and contest results as they happen. Follow Monster Energy on Facebook, Instagram, Twitter for exclusive behind-the-scenes looks in Aspen.